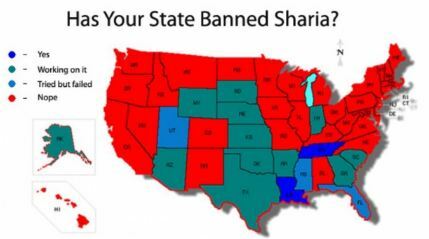 Islamist organizations are hard at work creating Muslim enclaves in the West, including right here in the United States. These efforts are designed to create Islamic autonomous areas, often with the expressed desire of incrementally bringing the host country completely under Sharia-based governance. This campaign has not stopped or even slowed down since FrontPage Magazine and the Middle East Forum shined the light on it one year ago. ← MIT’s New Super drug, ‘DRACO’ a cure for the common cold! We must remember that those who promote Sharia are seditionist. They must be arrested for plotting the overthrow of the United States. Not all of them are US Citizens. We must expel those advocating Sharia who have a Greed Card. Start sending letters to your DAs and County Sheriff. Finally, Islam does not warrant First Amendment protections. Anyone who says that it does, it just wrong. The First Amendment does not protect all religions. For example, religions that practice polygamy, human sacrifice, animal sacrifice, and sedition are not legal. Islam directs its followers to wage war, murder apostates, stone adulterers, etc. We need to fight Islam in the courts to strip it of any resemblance to First Amendment protections. The evidence is in their own Koran.